Whey Proteins (Whey Protein Concentrate, Whey Protein Isolate, and Hydrolyzed Whey Protein), Natural and Artificial Flavors, Xanthan Gum, Guar Gum, Salt, Lecithin, Sucralose, Ascorbic Acid, Potassium Citrate, Protease, Lactase, Silicon Dioxide. This product is intended to be used to supplement the diet; not to be used as a substitute for a varied diet. A varied and balanced diet and healthy lifestyle are esstential for good health. Do not use if packaging has been tampered with. Packed by weight, not by volume. Settling of product occurs after filling. KEEP OUT OF REACH OF CHILDREN. DO NOT EXCEED 10 SERVINGS PER DAY. STORE IN A COOL, DRY PLACE. Whey Proteins (Whey Protein Concentrate, Whey Protein Isolate, and Hydrolyzed Whey Protein), Birthday Cake Sprinkles (Contains Sugar, Corn Syrup, Corn Meal, Palm Oil, Corn Starch, Red Beet Powder, Turmeric, Paprika, Citric Acid, Blue 1), Natural and Artificial Flavors (Includes Milk Ingredients, BHA), Xanthan Gum, Guar Gum, Lecithin, Sucralose, Potassium Citrate, Protease, Lactase, Silicon Dioxide. CONTAINS: Milk, soy (lecithin), corn. Produced on machinery that also handles ingredients from egg, fish, wheat, crustacean shellfish (crab, lobster, and/or shrimp as glucosamine sources), tree nuts (including coconut, hazelnut), and sulfites - this product may inadvertently contain any of those ingredients. Whey Proteins (Whey Protein Concentrate, Whey Protein Isolate, and Hydrolyzed Whey Protein), Natural and Artificial Flavors (Includes Milk Ingredients, BHA), Xanthan Gum, Guar Gum, Lecithin, Sucralose, Potassium Citrate, Protease, Lactase, Silicon Dioxide. Whey Proteins (Whey Protein Concentrate, Whey Protein Isolate, and Hydrolyzed Whey Protein), Cocoa (Processed With Alkali), Natural and Artificial Flavors (Includes Milk Ingredients, BHA), Xanthan Gum, Guar Gum, Salt, Lecithin, Sucralose, Potassium Citrate, Protease, Lactase, Silicon Dioxide. CONTAINS: Milk, soy (lecithin), corn. Produced in a facility that also handles ingredients from egg, wheat, tree nuts (including coconut, hazelnut), peanut. CONTAINS: Milk, soy (lecithin), tartrazine, corn. Produced in a facility that also handles ingredients from egg, wheat, tree nuts (including coconut, hazelnut), peanut. Whey Proteins (Whey Protein Concentrates, Whey Protein Isolate and Hydrolyzed Whey Protein), Peanut Powder, Cocoa (Processed with Alkali), Mini Chocolate Chips (Sugar, Palm Kernel Oil, Cocoa Powder, Lecithin, Sorbitan Tristearate), Mini Peanut Butter Chips (Partially Defatted Peanuts, Sugar, Hydrogenated Palm Kernel Oil and Hydrogenated Soybean Oil, Corn Syrup Solids, Dextrose, Modified Milk Ingredients, Salt, Artificial Flavor), Natural and Artificial Flavors, Salt, Xanthan Gum, Guar Gum, Lecithin, Sucralose, Potassium Citrate, Protease, Lactase, Silicon Dioxide. Whey Proteins (Whey Protein Concentrates, Whey Protein Isolate and Hydrolyzed Whey Protein), Natural and Artificial Flavors (Includes Milk Ingredients, BHA), Xanthan Gum, Guar Gum, Salt, Lecithin, Freeze-dried Strawberry Bits, Red Beet Powder, Sucralose, Citric Acid, Potassium Citrate, Protease, Lactase, Silicon Dioxide. CONTAINS: Milk, soy, peanut, corn. Produced on machinery that also handles ingredients from corn, egg, fish, wheat, crustacean shellfish (crab, lobster, and/or shrimp as glucosamine sources), tree nuts (including coconut, hazelnut), peanuts and sulfites – this product may inadvertently contain any of those ingredients. Whey Proteins (Whey Protein Concentrates, Whey Protein Isolate and Hydrolyzed Whey Protein), Birthday Cake Sprinkles (Contains Sugar, Corn Syrup, Corn Meal, Palm Oil, Corn Starch, Red Beet Powder, Turmeric, Paprika, Citric Acid, Blue 1), Natural and Artificial Flavors (Includes Milk Ingredients, BHA), Xanthan Gum, Guar Gum, Lecithin, Sucralose, Potassium Citrate, Cinnamon, Protease, Lactase, Silicon Dioxide. CONTAINS: Milk, soy (lecithin), corn. Produced on machinery that also handles ingredients from corn, egg, fish, wheat, crustacean shellfish (crab, lobster, and/or shrimp as glucosamine sources), tree nuts (including coconut, hazelnut), peanuts and sulfites – this product may inadvertently contain any of those ingredients. Whey Proteins (Whey Protein Concentrates, Whey Protein Isolate and Hydrolyzed Whey Protein), Natural and Artificial Flavors (Includes Milk Ingredients, BHA), Xanthan Gum, Guar Gum, Lecithin, Sucralose, Potassium Citrate, Protease, Lactase, Silicon Dioxide. Whey Proteins (Whey Protein Concentrates, Whey Protein Isolate and Hydrolyzed Whey Protein), Mini Chocolate Chips (Sugar, Palm Kernel Oil, Cocoa Powder, Lecithin, Sorbitan Rristearate), Natural and Artificial Flavors (Includes Milk Ingredients, BHA), Xanthan Gum, Guar Gum, Lecithin, Sucralose, Potassium Citrate, Protease, Lactase, Mint Green Color Blend (Blue 1, Yellow 5 [Tartrazine]), Silicon Dioxide. Whey Proteins (Whey Protein Concentrates, Whey Protein Isolate and Hydrolyzed Whey Protein), Cocoa (Processed with Alkali), Natural and Artificial Flavors (Includes Milk Ingredients, BHA), Xanthan Gum, Guar Gum, Salt, Lecithin, Sucralose, Potassium Citrate, Protease, Lactase, Silicon Dioxide. CONTAINS: Milk, soy (lecithin). Produced on machinery that also handles ingredients from corn, egg, fish, wheat, crustacean shellfish (crab, lobster, and/or shrimp as glucosamine sources), tree nuts (including coconut, hazelnut), peanuts and sulfites – this product may inadvertently contain any of those ingredients. Whey Proteins (Whey Protein Concentrates, Whey Protein Isolate and Hydrolyzed Whey Protein), Natural and Artificial Flavors, Xanthan Gum, Guar Gum, Salt, Lecithin, Sucralose, Ascorbic Acid, Potassium Citrate, Protease, Lactase, Silicon Dioxide. It may shock you, but some of the most expensive parts of any protein powder are the actual flavor ingredients themselves. Gram for gram, the flavoring ingredients can cost more than 10 times as much as the whey protein! Like anything in life, you get what you pay for. It's pretty simple – include more flavor, and you'll have a better-tasting protein. But in an effort to cut costs and boost profits, many brands use the least amount of flavoring available. The result is the current bland-tasting whey proteins you'll find in stores and online. PRO100 is different. It contains the absolute best-quality flavoring system on the planet and we did taste test after taste test until we got it right. The end result is a protein shake that's so delicious you'll want to try all seven flavors. 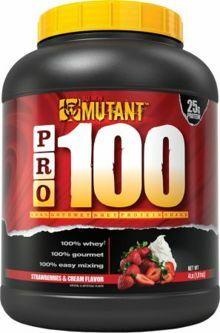 Each Mutant Pro 100 flavor is rich and creamy with absolutely no bitter whey after taste. It goes down smooth and will rock your taste buds!